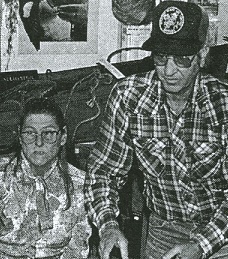 Lester and Dorothy Gayneaux used their native tongue to explain the Cajun traditon of hunting alligators. Gayneaux showed video footage of him administering "coup de grace" to several tail-lashing gators with a 9 mm hog-leg he wears Western-style in a leather hip holster. He showed how to use half of a ripe chicken to bait a large hook at the end of a rope suspended over the water by a clothespin ona pole stuck in the bank. The gator comes up out of the water, yanks the bait fromt he clothespin, and swallows the hook. Dorothy Gayneaux explainedthat blackbirds make the best bait.